Chord formulas show all the notes which constitute a chord. They reveal the structure of chords. They provide a link between scales and arpeggios. Knowing the structure of chords will help you find any chord position on the guitar when you only have the name. 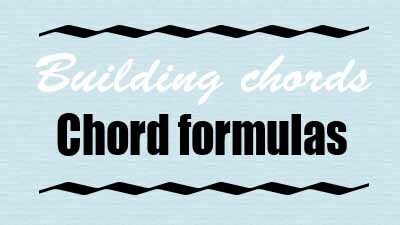 Learning chord formulas will make it easier to understand the difference between the many types of chords. Learning chord formulas is necessary for anyone who wants to expand their musical knowledge and increase their guitar playing skills. This guitar lesson provides 30 exercises with tabs, audio files and YouTube links to understand and improve what is called octave playing popularized by Wes Montgomery. Guitar infographic about extended arpeggios, extensions, upper-Structure of chords, superimposition, secondary arpeggios, chords from the diatonic scale. This guitar lesson provides useful information about extended arpeggios, upper-structure of chords, superimposition, secondary arpeggios and diatonic scale harmonisation. This infographic for guitar teachers and students provides major 6 and minor 6 arpeggio diagrams with their related chord positions.